Due to heavy work load at my day job (end of quarter, yay! ), I will be posting short and little these days. Looking forward for the weekend. I read somewhere that in naval warfare the most important thing is the ability to make decisions quickly. I had my share of hesitation in this scenario. Keep my formation sailing towards the Canal or make a stand and confront the threat? 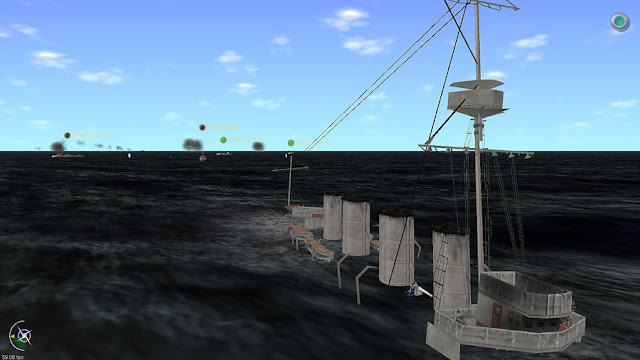 The British formation is approaching and I don't want to be caught with my ships negotiating the narrow Canal. 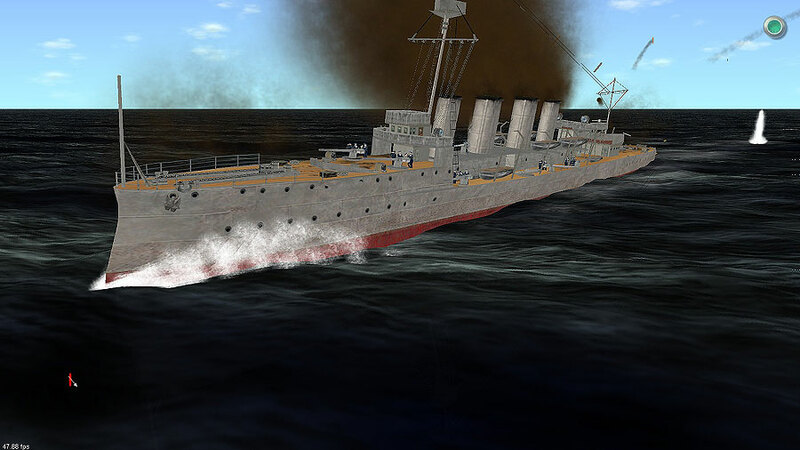 I order the Moltke to make a sharp turn (actually an euphemism for a ship of this size) due north. In that way she can have all guns bearing the enemy. 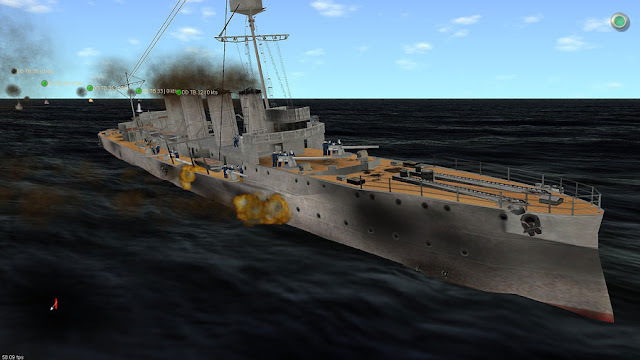 The SMS Moltke has changed course north and now all guns are shooting at the enemy. The Moltke's turn almost doubles our firepower, but with the British sailing in a column formation the target is just the bow of the Boadicea. The guns of the Moltke score some hits, but they don't stop the enemy column. An early hit on the HMS Boadicea doesn't stop her. With the Moltke sailing north and the Boadicea (plus trailing destroyers) sailing west, the closure rate goes through the roof and the battle's pace increases to an uncomfortable speed. 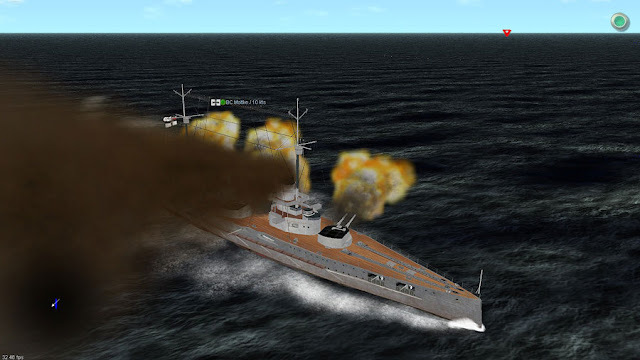 With her turn north the Moltke has increased it's firepower with all the big guns firing towards the port side. However, the rate of fire of the Moltke remains fixed at two salvos per minute. Accuracy increases, though. 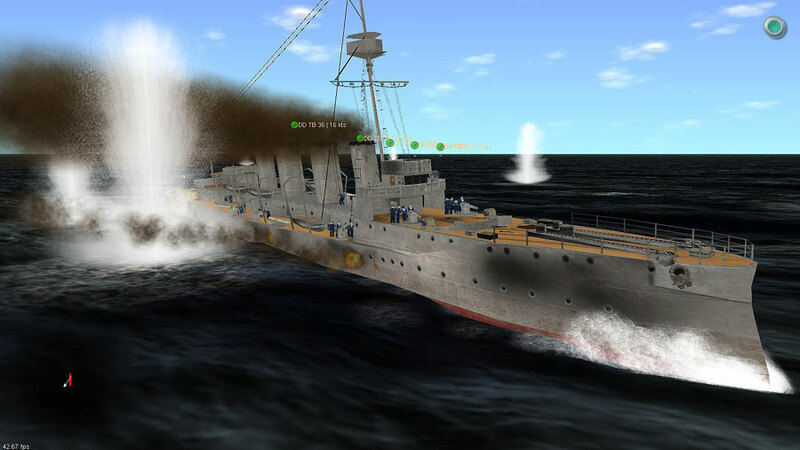 The Boadicea gets closer and feels the heat of more precise gunnery. I waited too much ... 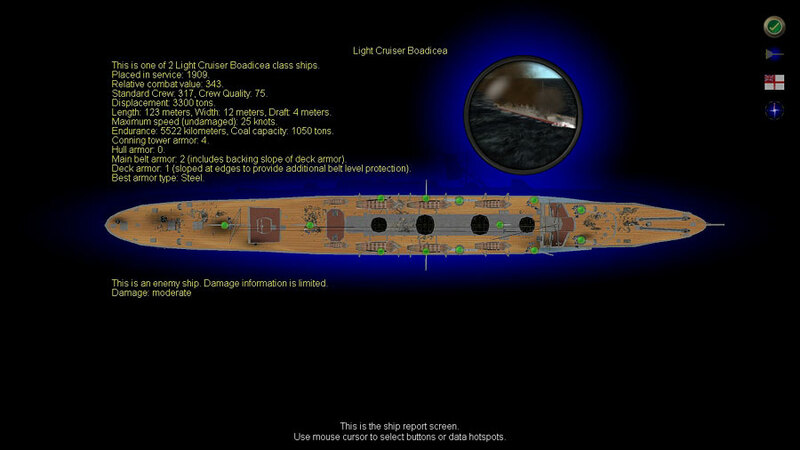 I really believed that I could score a critical hit on the British light cruiser. It didn't happen. Instead, I wore down the van of the column in an excruciating exercise of damage accumulation. 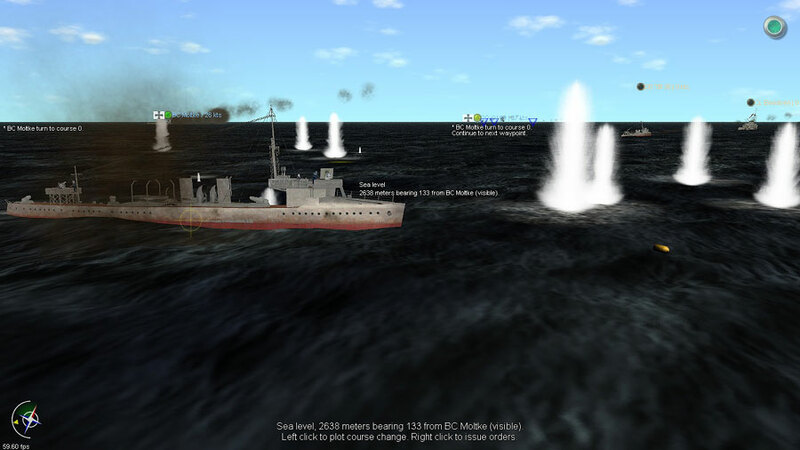 The Boadicea is now in range and valiantly challenges our fire with her 4 inch guns. But she is out of the fight ... finally. With a moderate angle of list and at least two fires in her guts, the HMS Boadicea comes to a halt. Note the shell splashes now near the trailing destroyers. The range at this point is murderous: 4,000 yards. That means that the British destroyers have a chance to get the Moltke with their torpedoes. I immediately order my destroyers to join the fight and the Moltke to start a zigzag course slightly north east to put some distance with this knife fight. The British destroyers under fire from the HMS Moltke. They quickly turn around and try to flee. The guns of the Moltke were more than enough to deter and to heavily damage some of the destroyers. 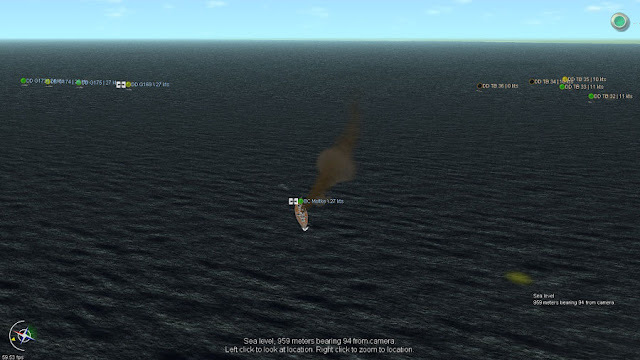 On the meantime, the HMS Boadicea sinks. End game. The HMS Moltke is in the foreground, putting some distance from this battle. Note the German destroyers (top left) starting their pursuit of the British destroyers (top right). Under the command of a seasoned armchair captain, this engagement is a turkey shoot. A battlecruiser like the Moltke just has bigger guns than the Boadicea. Period. Though I could get my formation out with just moderate damage on the destroyers, I really think that I did put the Moltke through unnecessary risk. HI JC, do you have the Doggerbank addon? If yes, is it worth the money? Good job Julio. Thanks for finishing this one up... the game looks good.